Considering that you spend 40 hours a week there, shouldn’t your office or cubicle be comfortable and inviting? Contrary to popular belief, keeping an austere work space doesn’t promote productivity. By surrounding yourself with nice decor and personalized touches, you’ll feel way more at home and better able to tackle your daily tasks. Get inspired with these great work space decor tips! Create a Gallery Wall – Gather an assortment of personal photos and pretty art prints, and arrange them artfully on one wall. If you’re feeling especially ambitious, treat the wall like a page from a scrapbook and enhance it with themed decals, ribbons and other decorative touches. Spruce Up Your Storage – Storage bins, cubbies and boxes ensure that everything has a proper place. All too often, however, organizational pieces are bland and boring. Brighten up letter boxes and other storage pieces with colorful paint. If you’re artistic, consider painting eye-catching patterns onto banker’s boxes and the like to make them more aesthetically pleasing. Use Wall Space Effectively – Invest in some cork strips, and install them on the walls of your office or cubicle. Press tacks into them to serve as hangers for things like lanyards, keys and other important items. You can also use them to proudly display thank you notes and other correspondence. Personalize with Contact Paper – Put a personal twist on filing cabinets, shelving units and other parts of your work space with colorful or patterned contact paper. These days, contact paper is available in a dizzying array of styles, so it’s easy to find a design that suits your preferences. Your boss shouldn’t mind, either, because it comes off just as easily as it goes on. Get Cozy – No, you shouldn’t nap while on the clock. However, that doesn’t mean that you shouldn’t be comfortable. Keep a throw blanket and pillow handy for chilly days. While they’re not in use, they will add a splash of down-home style to your work space. 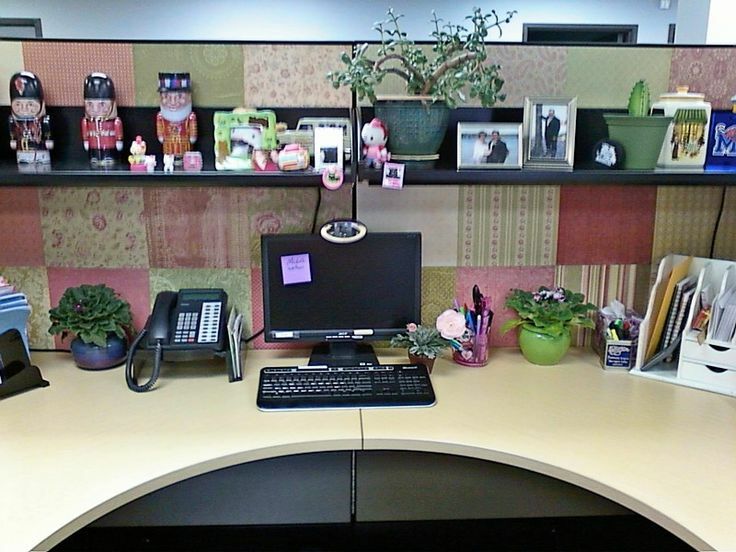 Go Green – One of the best types of work space decor requires a bit of upkeep, but it’s more than worth it. Add a plant or two to your cubicle or office to lend it a touch of outdoorsy allure, but make sure to choose plants that thrive in low-light conditions if you don’t have any windows. If you do have windows, cacti and other succulents are excellent choices. Having a work station installed is just the first step in setting up an office or cubicle. The real fun begins when you start personalizing your surroundings, and they sky’s the limit in terms of what you can do. Start with the preceding work space decor ideas, and then expand upon them with some of your own ideas!